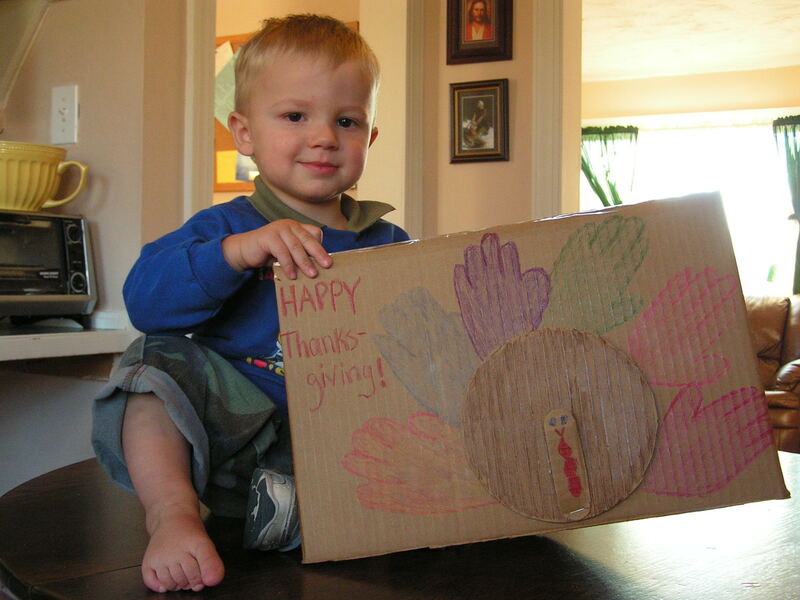 Here’s a Thanksgiving decoration your kids can make. I had my 18-month-old help me and he had so much fun he was mad when we were finished! To start, cut the bottom and top off the box so it’s just the sides. Cut one of the long sides off, so you have one long side remaining with a short side attached on both sides. On the side you cut off, trace a circle and cut it out. This will be the body of a turkey. Cut out a long oval shape for the turkey head and neck (I used the section of cardboard that comes apart from the box handles. Color the circle brown, and draw a turkey face and gobble on the oval piece. On the long side of the 3 section cardboard piece, trace a circle in the middle bottom of the box (use the same circle pattern as for the turkey body). Using your child’s hand, trace hand patterns around the circle and color them in. Staple the turkey neck to the front of the turkey body. Tape the turkey body into the circle pattern. Write Happy Thanksgiving on the top or side if desired. Take the two side pieces and tape them together in the back so it will stand alone. Display at your Thanksgiving activities and dinner!